Right now in offices all along the eastern seaboard, shorebird technicians are hunched in front of computer monitors tapping numbers into spreadsheets. A mundane end to six months spent observing life and death on the beach, but an important step to capture what played out during the breeding season. “From when the birds arrive in March to when they leave in August, we are checking on them every day, recording progress with eggs and chicks, and tracking predator species, so you can only imagine the amount of data we collect,” explained Emily Heiser, a wildlife biologist with the Conserve Wildlife Foundation (CWF) of New Jersey who assists with running the state’s monitoring program for the federally listed piping plover. I did. It adds up to a lot of data, and until this year, you would have had to triple that amount to capture the total workload for her staff. All of the data that was recorded into notebooks in the field had to be transcribed onto paper datasheets in the office, and then transferred into a spreadsheet at the end of the season. But no longer in New Jersey. “There is no transcribing. There is no data entry. Now you just collect it in the field and all you have to do is check it at the end of the season to make sure the information accurately reflects what happened,” said Heiser. That’s because shorebird biologists in the Garden State aren’t using notebooks anymore. They’re using NestStory, an application for their smartphones. I know what you’re thinking: It’s 2017. What took them so long? Well that’s what Jim Verhagen was thinking too. A seasonal resident of Long Beach Island, N.J., Verhagen had developed a relationship with staff at CWF over the years based on a shared appreciation for the local bird community. As an avid wildlife photographer, he too spent a lot of time observing birds in the field. But as a computer programmer, he knew he could harness technology to use his time more effectively. “I made an app for myself for tracking the birds I was sighting — particularly piping plover and peregrine falcon — so I could try to map their exact locations for the purposes of taking better photos,” he explained. As Verhagen figured out how to use smartphone technology to more accurately track beach nesting birds, he realized that the people who really needed precise information on these species were still doing things the old-fashioned way. He showed his app to a few people in the plover world, but met resistance. “They would say, ‘We tried something like that once. It didn’t work,’ ” Verhagen recalled. Then he showed it to Michelle Stantial, a PhD student at the State University of New York College of Environmental Science and Forestry (SUNY ESF) who is studying factors that limit reproductive success of the federally listed piping plover in southern New Jersey. Stantial recognized the potential immediately. She coordinates data collection at nine study sites in the state in collaboration with a number of different organizations. The application provides a common format for collecting data, a central repository for storing it, and a platform for communicating with others who are doing the same thing. It’s also fun. “The main concept is that you run ‘missions’ at certain site, on a certain date, with a certain number of other people,” said Verhagen. Say you are on a mission at Barnegat Light, the app will automatically record the weather data and the tidal stage, and then open a checklist of required activities that you must complete — essentially nest checks. A screenshot from the NestStory app. That’s all you have to do, but there are many other things you can do, such as take photos or record notes. You can even request to have a custom module — or questionnaire — added to the app a part of your team’s mission. For example, if you want to everyone to record certain information about predators or human activities. But NestStory’s biggest selling point is that it was built with input from its target audience: biologists. Verhagen worked closely with Stantial to make sure the app would be practical for data collection in the field, and would also support the application of that data for management needs. NestStory outputs data to U.S. Geological Survey standards, and can feed data directly into another new tool called PiperEX, designed to help managers decide when to use a nest exclosure. Stantial tested the app for her own data collection in 2016, and then presented it to her peers at the annual piping plover conference in the fall. This year, both SUNY ESF and the CWF agreed to pilot NestStory for their entire piping plover data collection efforts in New Jersey, including at the Edwin B. Forsythe National Wildlife Refuge. “It might not seem like it because using notebooks and paper is common practice, but this is a really huge step into the future of data collection,” said Stantial. This entry was posted in Blog entries, Endangered Species, Migratory birds, National wildlife refuges and tagged conserve wildlife foundation of nj, Emily Heiser, Jim Verhagen, NestStory, PiperEX, piping plover, shorebirds, suny-esf on September 7, 2017 by bridgetmacdonald. Lee Halasz is a native of Australia and is a former conservation professional with the Queensland State Government. He and his family now reside in western Massachusetts, and he volunteered his time with us in 2015. This spring, we feature a series of bird stories Lee wrote to celebrate #birdyear. Will you be at the beach this summer? Keep an eye out for breeding shorebirds. The beach is a fantastic place to be. All year round it is a fun and inspiring element of our landscape, and part of that enjoyment comes from being around distinctive coastal birds. Most of us only go the beach in summer, when we can enjoy the weather and water to relax and have fun. Summer is also an important time for many shorebirds; it is when they come to Northeast beaches to breed. The beach is a thin strip of naturally precarious habitat in a dynamic environment. It is subject to the power of waves and wind, and extremes of temperature. Despite these challenges, this is where beach-nesting shorebirds have successfully bred through time. The increased use of beaches by humans has introduced a new variable. The Northeast becomes home to more people every year, and over time society has become more affluent and gained greater freedom to enjoy coastal areas. These patterns have resulted in greater impacts on coastal environments and coastal wildlife, and consequently we need to take actions to ensure that beaches remain a safe place for shorebirds. Beachgoers can drastically reduce the breeding success of beach-nesting shorebirds. The eggs and chicks are well camouflaged and can unknowingly be crushed by people walking above the high tide line. Also, if adults are flushed from the nest, chicks and eggs can suffer heat stress without the protective shading offered by the parents, and unattended eggs and chicks can be destroyed and eaten by predators. There are some great shorebird recovery success stories. In Massachusetts, targeted actions have seen piping plover populations bounce back dramatically in recent decades, and American oystercatcher populations are recovering impressively since returning to the Northeast in the last half century. Some of this success is attributable to programs like the Atlantic Flyway Shorebird Initiative that increase the focus on shorebird conservation. 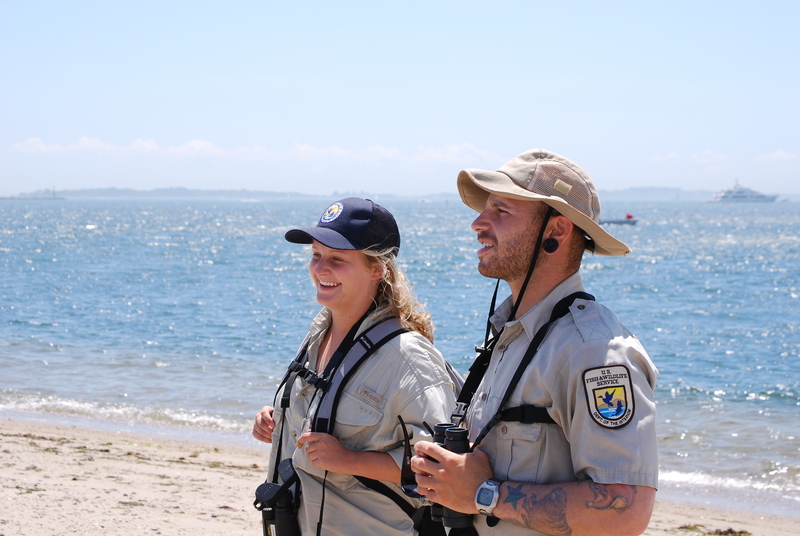 For example, many of the contributing partners organize summer beach stewards who raise awareness of nesting shorebirds, educate people about them, monitor nests, and notify authorities if protective action is needed. Have a carry-in carry-out policy: Trash left on beaches can attract nest predators. Don’t feed gulls: While it may be fun and seems harmless, gulls can eat shorebird eggs and chicks. Walk your dog on a leash: Dogs love to chase and catch wildlife, including shorebirds, and just the stress of being chased, especially repeatedly, can lead to eggs and chicks being abandoned. Respect wildlife protection signs: Please keep out of posted nesting areas. Be aware of wildlife: If birds are calling loudly around you, dive-bombing you, or feigning injury, there are probably nests nearby. Please back away. Perhaps the most important thing anyone can do is to recognize that shorebirds live and breed on the same beaches that people enjoy. Summer is coming. Enjoy it, but please enjoy and respect the shorebirds also. This entry was posted in Blog entries, Migratory birds and tagged American oystercatcher, Backyard Birds, beach, bird year, birding, migratory bird treaty act, Migratory Bird Treaty Centennial, Migratory birds, piping plover, shorebirds, summer, terns on June 7, 2016 by tmlama. You try being a plover parent! When the piping plovers land on Rhode Island beaches in late March, we start heading out there daily to check on them, identifying pairs that will soon breed and lay eggs on the sand, putting up exclosures to protect those nests and the chicks when they hatch out, and keeping an eye on them as they grow their flight wings—which allow them to escape predators and other disturbances. This year, we were extremely disappointed to discover a two-week-old plover brood—four chicks—abandoned by their parents. It is very unusual for adults to abandon their chicks. This sometimes happens when predators kill the parents, or severe disturbance drives the parents away from the nest. When adults or chicks are frightened by disturbances, they may be unable to access safe areas to feed, and can starve or face predators. The parents usually stay with chicks until about a week after the chicks can fly. We—the Rhode Island National Wildlife Refuge Complex staff—were concerned with the brood’s ability to forage safely without the shepherding behavior of the adults. To alleviate the disturbance in heavily visited area with beachgoers, kayakers and dog walkers, we adopted a management technique that is used for terns and deployed a “chick shelter.” We gathered fresh wrack (the piles of plants and such that wash up on the beach) and moved it to the protected roped area, and we provided water in plastic bowls; these would allow the chicks to feed without making a lot of treacherous trips. While I can’t stress enough that these management techniques should be critically evaluated on a beach-by-beach and case-by-case scenario by a plover biologist because of the risk of predators keying in on the shelters (especially if they are widely used) or decreasing parental attendance to chicks, I’m excited to say that these orphaned plover chicks responded extremely well to the aid and immediately inspected their new shelter and water bowls. Knowing that our intervention was effective and played a role in helping the chicks fledge was an awesome feeling. I feel good about the 2014 season—on the sites we manage, we had 71 pairs of plover parents that fledged a whopping 98 chicks (that means that an average of about 1.38 chicks survived per pair, usually out of a brood of four). The continued success of this program can be attributed to the many partnerships between organizations, government agencies and landowners who all work together to protect this rare, charismatic shorebird. But we still have a lot of work to do. And I’m looking forward to the 2015 season and will be focusing on management actions that will increase our productivity. The Rhode Island National Wildlife Refuge Complex manages and monitors piping plovers on sixteen different beaches in Rhode Island. Three of the sites are national wildlife refuges and the remaining thirteen are a combination of state and privately owned properties. We’re grant-funded to support the State of Rhode Island Department of Environmental Management, and the grant is matched by landowners and volunteers that provide vital support to conserving plovers. This entry was posted in Blog entries and tagged bird conservation, endangered species, endangered species act, piping plover, Rhode Island, rhode island national wildlife refuge, Ryan Kleinert, shorebirds on November 18, 2014 by usfwsnortheastblog.